I'm back! Sorry for the long hiatus; between finals, beach week, graduation, and moving out, I've had a lot on my mind lately! Anyway, this isn't time for excuses, it's time for tea. This particular tea, a handmade Nilgiri, is a gift from my good friend Dustin. I tried one or two Nilgiris years ago and was unimpressed, but this tea has shown me that Nilgiri is not simply an inferior version of Darjeeling. That said, this tea is an awful lot like Darjeeling. If I recall correctly, the Nilgiri region is just one mountain range away, so it's really not too surprising. 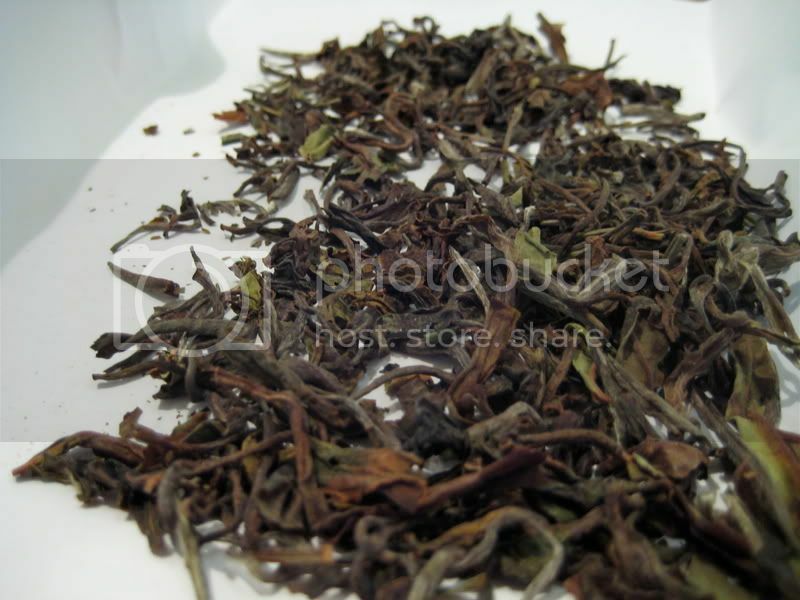 The leaf, nice and whole, looks just like a second flush Darjeeling, with a mix of browns, whites, and greens. It smells (and oh boy, does it ever!) like a cross between Darjeeling and Ceylon, actually; it's like a Darjeeling with a bit of the edge smoothed out, which I enjoyed. I brewed it just as I would a Darjeeling: 4 grams of leaf, 10 oz of water (yes, I like to make things inconvenient for both metric and non-metric users), and 2 minutes of steep time. The first steep was a bit under-brewed, but still good. It was sweet, fruity, floral, and had nice body. It's not quite as complex as a top-notch Darjeeling, but it makes up for it with solid, powerful flavor. The second steep had more "tea" flavor ("tea" referring to typical American-brewed tea), but was still good. Overall, I would definitely recommend this tea— especially to someone exploring Nilgiri tea or to a devout Darjeeling drinker who is looking for a change of pace. Thanks again to Dustin for providing me with the sample, I enjoyed it very much (plus, I got to use an old teapot I had all but forgotten about)! 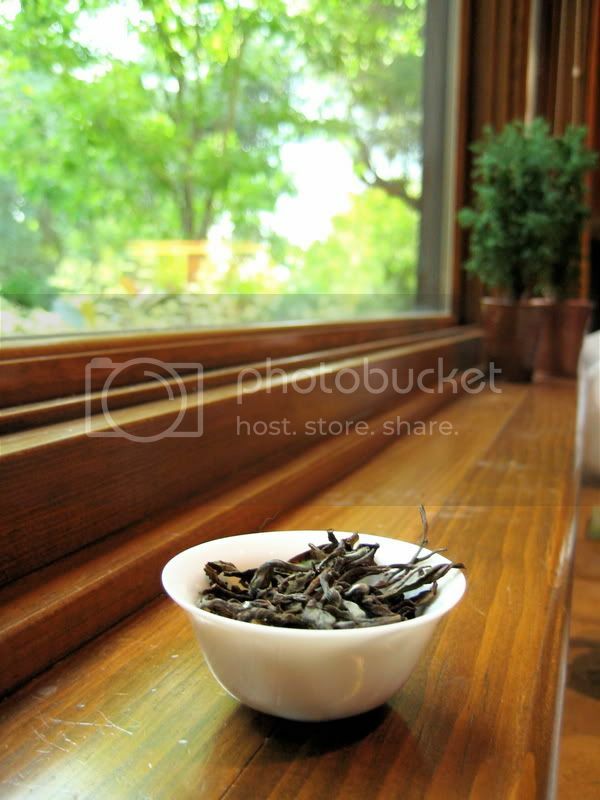 I'd love to drink some tea next to that spacious window, which overlooks the beautiful trees. Also, the new Tea Nerd heading with the sencha, looks gangbusters. Bamboo, yes, the window is quite nice. However, right outside is where my dog poops, so it's not the most pleasant place to stand on a hot day. Thanks for the compliment on the new header, I'm much happier with this one. I hope you don't mind me correcting you, but Nilgiri refers to a mountain range in the south-east of India (about 16 degrees of latitude closer to the equator than Darjeeling, not just the next range over). The tea gardens are located somewhere between Darjeeling and Sri Lanka (although much closer to Sri Lanka), so the cross between the two applies on different levels. 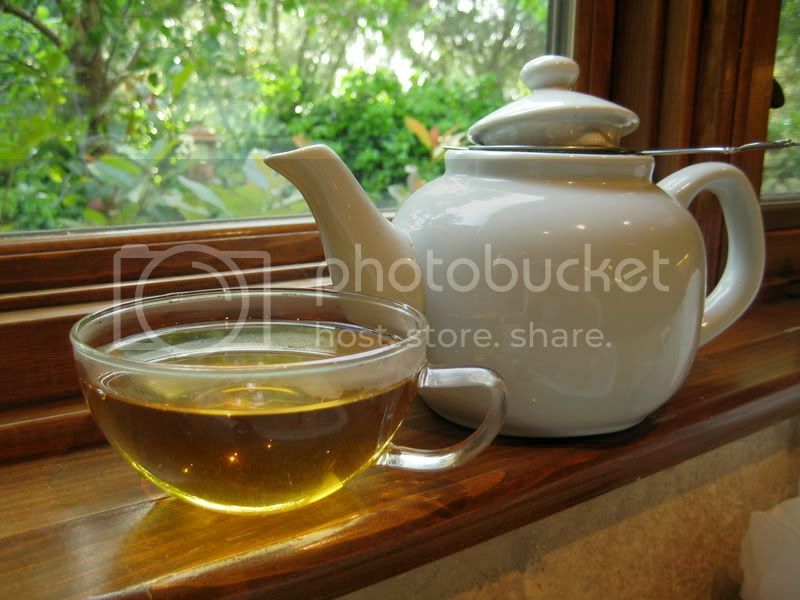 So far, I haven't come across any Nilgiri tea that brews as light as the tea in your pictures. The infusion would even be light for most first flush Darjeelings (with the exception of a few very "green" ones like the highest grades from Makaibari). 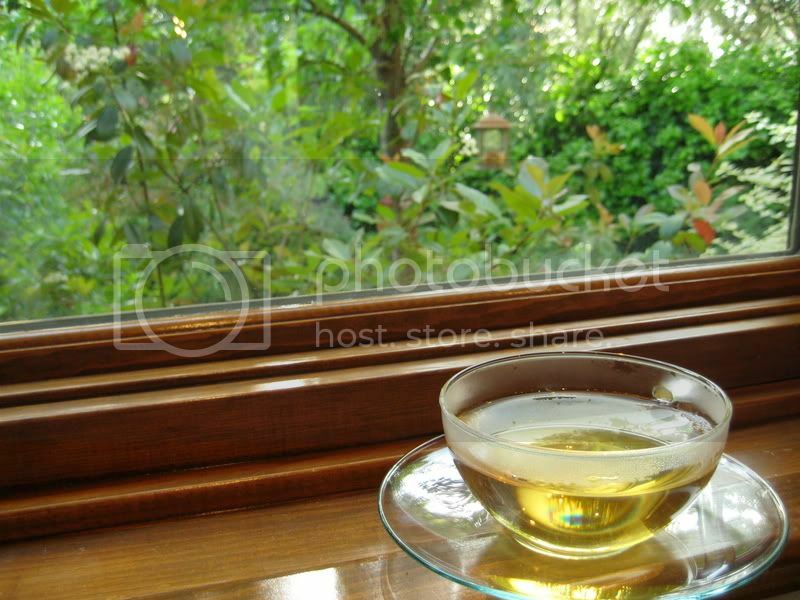 I've noticed that Darjeelings (and apparently Nilgiris as well) with fuller leaves brew lighter. I had a second flush Makaibari that was a similar color, and it's leaves were quite whole too. I also don't brew these teas for as much time as many other people, so that may be a factor as well. I don't think the color of the infusion is too closely related to the leaves being intact (I assume by fuller you mean unbroken). Some very high end full leaf first flush Darjeelings (this year's Arya Ruby,for instance) produce a rather dark infusion. Makaibari is a tea estate that generally produces pretty "green" flushes (i.e. the leaves are not completely oxidized and brown, but rather a melange of silver, brown and green). The Nilgiri in your photos also contains a lot of greenish leaves which are most likely responsible for the paleness of the infusion. In all seriousness though, thanks for correcting me; I'd rather look ignorant than continue to be ignorant. I don't believe that there is an ignorant when it comes to tea - at least if one shows a genuine interest. There is only the case where one doesn't have enough experience yet. Looking through your very enjoyable and beautifully executed tasting notes, it is quite clear that black Indian teas are not at the top of the "most covered" list. I personally started my tea journey many years ago with Darjeeling teas (which still are very special to me) and worked my way through Japanese Greens to Chinese teas, finally reaching pu-erh a few years back. I'd seriously say that there is not one day that I don't learn something new about tea. Regarding catching mistakes: that's the beauty of the interactive web, isn't it? Jo is correct. The best Nilgiri estates now increasingly try to employ hard wither in Darjeeling style, possibly inspired by highly-paying German buyers (such as Tee Gschwendner), and this results in a lighter, more fragrant liquor.